This is my contribution to The Late Show, the Late Films Blogathon organized by David Cairns, proprietor of the wonderful Shadowplay. 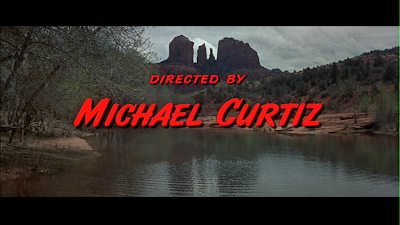 Michael Curtiz was an extraordinarily prolific director, releasing at least one film a year - and sometimes many more - from his early career in Hungary to The Comancheros, which appeared just six months before his death. 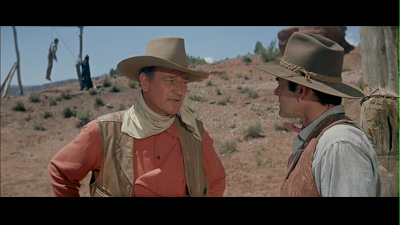 Although his most fertile creative years were behind him by the 1960s, there's no mistaking the craft in his final movie, giving the lie to the (fairly lazy) conventional wisdom that this was John Wayne's project, with Curtiz merely along for the ride. That conventional wisdom stems mostly from the fact that several key personnel, particularly behind the camera, had prior connections with Wayne--writer James Edward Grant, producer George Sherman and cinematographer Bill Clothier, to name but three. However, it's not as though Curtiz was submerged by untested talent: Sherman, a pedestrian director himself, assembled a fine group of collaborators here, a group of experienced movie men whose careers dated back to the 1930s. In any case, Curtiz was hardly a novice at quickly integrating with a new production team given his own long and varied career: it's hard to direct over a hundred movies without being able to rapidly find your bearings within a new crew. Most written accounts suggest that Curtiz's work on The Comancheros was restricted to the interiors given his own advancing cancer, but James Crighton Robertson unearthed evidence, in his book The Casablanca Man, that Curtiz was injured on location in Utah while shooting a scene with Wayne. 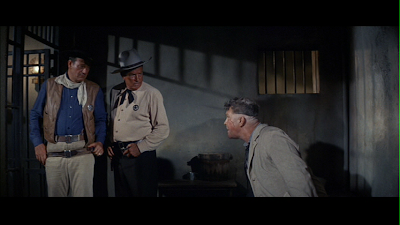 The imaginative staging of several of the outdoor sequences certainly suggest his experienced hand - for instance in the striking shot where Wayne and Stuart Whitman debate their options, with one outcome suggested over Wayne's shoulder. In any case, as David Niven's famous "bring on the empty horses" story indicates, Curtiz was not the kind of director to sit idly by while the second unit worked. Of course, quite what Niven was doing on set at that stage of The Charge of the Light Brigade is anyone's guess, since his character had exited stage-left long before the climactic scenes were filmed. One assumes, not for the first time, that he was recounting a tale told by others, although improving it in the process. Wayne had just come back from shooting Hatari! when the production began, and he headed off to make The Man Who Shot Liberty Valance just days after The Comancheros wrapped. 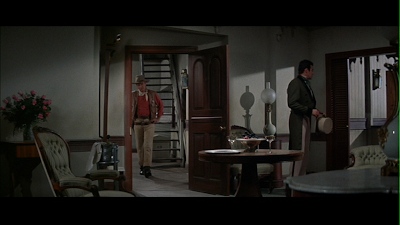 This is admittedly a minor in-between affair, but very nicely staged, owing something more to Howard Hawks than to John Ford, particularly in the laconic banter between Wayne and, well, everyone else in the film. 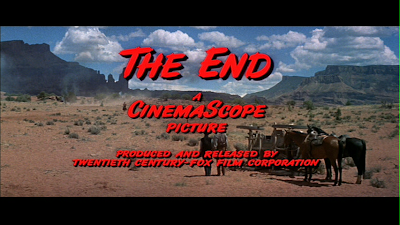 Indeed, the film comes across as something of a prototypical buddy film, a western Midnight Run with the roles reversed: here the prisoner (Whitman) is the hair-trigger member of the duo, whereas Wayne, who plays a Texas Ranger, is the almost infuriatingly easygoing partner, with quite a selection of trademark lines (proving it's no bad thing to have screenwriter pals). Curtiz moves ably back and forth between comic and dramatic scenes, integrating the action sequences with wonderful character actor interludes. 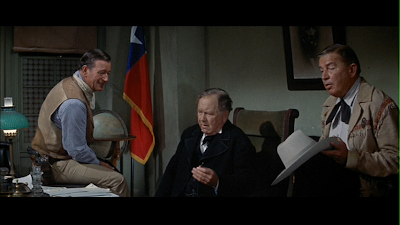 He has the same instincts for the ripe character moment as he had in his Warner Brothers days, giving time here to perennial bit-part actors like Guinn Williams (unfortunately uncredited, and doubly so, for this proved to be his last role; another Late Show) and Edgar Buchanan. 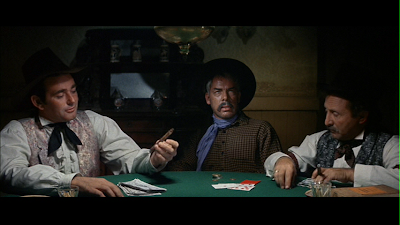 The most notable supporting role, though, goes to Lee Marvin, onscreen for just a couple of indelible scenes, his head half-shorn and his temper all mean. His scenes with Wayne are a treasure, the Duke remaining impassive as Marvin progressively loses his rag, with predictable consequences. I think there's something to David Cairns's suggestion that Curtiz was not in his element with the bright colours of postwar Hollywood, although he did made wonderfully atmospheric use of an early two-strip Technicolor process in Doctor X (1932; Craig Keller has some terrific screen grabs) and Mystery of the Wax Museum (1933). 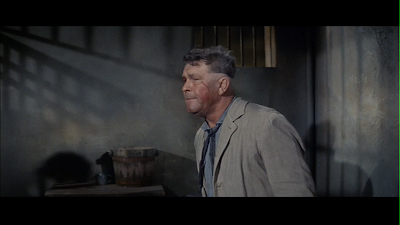 Black and white seems much more suited to the kind of shadowplay he clearly loved, although there are hints of the past in a jailhouse scene, shadows from the bars making a variety of patterns on the walls, or on Lee Marvin's face, half in shadow, in the poker scene. 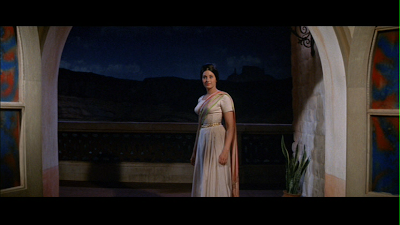 Even if colour wasn't Curtiz's preferred medium, he still crafts magical moments like the shot when we see Ina Balin framed in an archway, an instant that might have been lifted from an Indian film. Curtiz is also adept at using the frame to achieve a sense of depth, such as in the sequence when Wayne allows Whitman - who he's just arrested - to confirm that he's been abandoned by the woman he loves; the empty spaces tell us what we need to know. 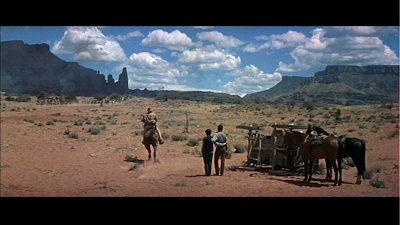 Wayne, waiting in the background, might be paying homage to the famous shot that concludes The Searchers, except this time we see him framed from a different angle. 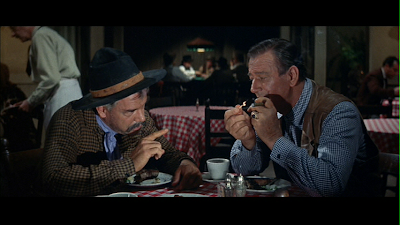 Similarly, a scene where Wayne and Marvin sober up over steaks is carefully constructed to include a glimpse of a poker game that will quickly become important to the plot; no mere background colour here. All this is to say that Curtiz was, at the end of his directorial career, exactly the kind of professional that Wayne and company were probably looking for when they hired him. The film, routine enough by big-budget Western standards, looks great, and Curtiz clearly still found enjoyment both in constructing the individual shots and finding the overall rhythm of his film. Perhaps, then, he was indeed along for one last ride, but it looks as though he enjoyed every moment in the saddle.